Wedding is a kind of event that may happen once in a lifetime. Help loving couples to remember it. 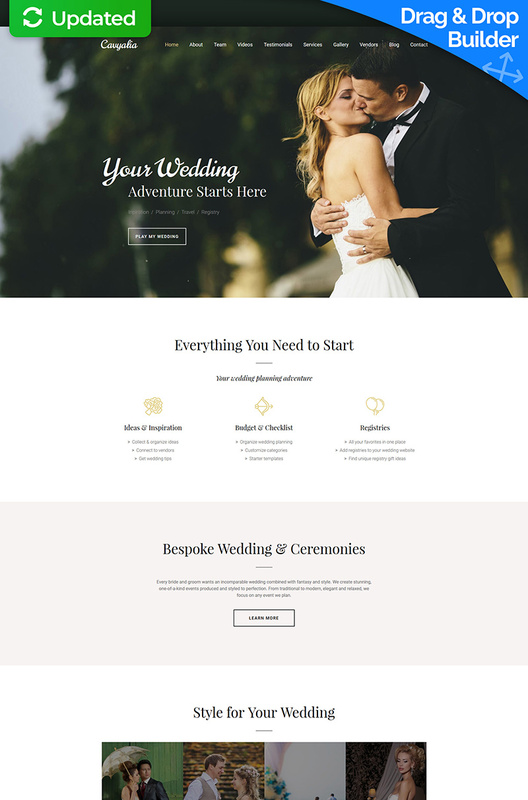 If you are a wedding planner, this Wedding Services Moto CMS 3 Template has been developed especially for you. The images of hugging and kissing people create a cute, lovable atmosphere on site. The choice of fonts can be called festive. Icons are also relevant for the topic. Pastel color scheme emphasizes the clean design and tender look of the web page. The style of the future wedding can be selected with the help of banners. This is what can be called truly intuitive navigation. Gallery, testimonials, pricing plans and news blocks are also available on the home page. You can link rounded social media icons with your profiles and promote your services there. We advise you to have a closer look at this template if it fits your business niche.